We’re equipped to accommodate 4 – 24 people in our newly renovated conference room with complimentary wi-fi and a very large screen TV. Tired of the same old institutional conference space? We have the solution. Berry Manor Inn is equipped to accommodate conferences and meeting space for 4 – 16 people in our conference room at the Berry Manor Inn or up to 24 people in our conference space at our sister property, the Rockland Talbot House, located directly next door. The inn has space for several breakout areas and a main meeting room. The conference room can be set up classroom style or with a large conference table to best meet the needs of your meeting. 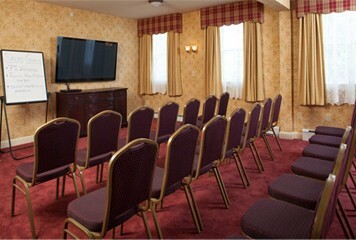 The conference room is equipped with complimentary Wi-Fi and a very large screen TV for presentations. Private overnight accommodations for each participant (1 person/room) can be provided for up to 19 participants on campus and the ability to offer an additional rooms at other local B&Bs close by. Breakfast, lunch, morning and afternoon refreshments (warm cookies!) 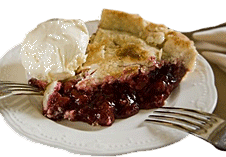 can be provided by the inn and the area boasts several fabulous restaurants (many in walking distance of the inn) for your dinner fare. Rates will vary depending on number of overnight guests and attendees, meal requirements and time of year, call us to start planning your next business meeting. Our inn with its many common rooms and small private spaces is an ideal setting for your next family reunion. Our Rockland, Maine bed and breakfast can accommodate up to 28 overnight guests and with the inn “yours” for the weekend you can have dinner catered at the inn, have a game night in the library, show those old home movies or create a new family tradition. The location of the inn makes it ideal to meet the needs of a large group, walk to town to shop, visit the Farnsworth Museum or the Transportation museum, take an afternoon sail on a schooner or a trolley ride around town. Enjoy a Maine family reunion for the memory of a lifetime. Looking for a Girlfriends Getaway? We work with several local spas and massage therapists and can help plan a pampering experience for you and your friends. We can help set up a winery tour, an olive oil or chocolate tasting at the inn for your group or many other fun activities. Plan your event at the holidays and we will even provide the decorated tree! 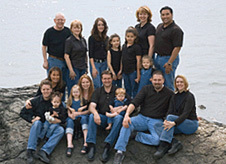 Call and let us start planning your next family tradition, girlfriend getaway or friend reunion.